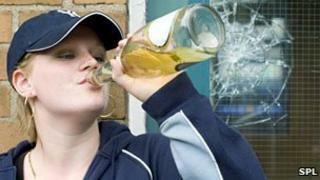 Image caption Adolescent girls could be risking damage to their brains if they binge drink. Teenagers - especially girls - who binge drink could be damaging the part of their brain which controls memory and spatial awareness, say Californian researchers. Young women's brains are particularly vulnerable to harm from alcohol because they develop earlier than men's. Tests on 95 adolescents aged 16 to 19 were carried out by researchers at several US universities. The study is published in Alcoholism: Clinical & Experimental Research. Researchers recruited 27 binge-drinking males and 13 females and gave them neurophsychological tests and "spatial working memory" tests to complete. Binge-drinking young women were defined as those drinking more than three pints of beer or more than four glasses of wine at one sitting. Binge-drinking men drank four pints of beer or a bottle of wine. The same tests were then carried out on 31 males and 24 females who did not have episodes of drinking heavily and the results compared. Using MRI scans, the study team found that female teenage heavy drinkers had less brain activation in several brain regions than female non-drinking teens when doing the same spatial task. They suggested that this could cause problems when driving, playing sports involving complex moves, using a map or remembering how to get somewhere. Susan Tapert, professor of psychiatry at the University of California and lead study author, said these differences in brain activity negatively affected other functions, like concentration and "working memory". The study describes "working memory" as using and working with information that is in your mind, like adding up numbers. It is also critical to logical thinking and reasoning. But the young men studied were not affected to the same extent, Dr Tapert said. "Male binge drinkers showed some, but less, abnormality as compared to male non-drinkers. This suggests that female teens may be particularly vulnerable to the negative effects of heavy alcohol use." Previous research has shown that among adult alcoholics, women are more vulnerable to the damaging effects of alcohol on the brain than men. Edith Sullivan, a professor in psychiatry and behavioural sciences at Stanford University, said that the brains of adolescent boys and girls appear to be affected differently by alcohol. "Females' brains develop one to two years earlier than males, so alcohol use during a different developmental stage - despite the same age - could account for the gender differences. "Hormonal levels and alcohol-induced fluctuations in hormones could also account for the gender differences. Finally, the same amount of alcohol could more negatively affect females since females tend to have slower rates of metabolism, higher body fat ratios, and lower body weight." Don Shenker, from Alcohol Concern, said the research demonstrates why reducing binge drinking among young people must be an urgent priority. "Ministers should go much further to clamp down on off-licence promotions which are driving under-age drinking and reviewing the extent of alcohol marketing which young people are exposed to and which makes drinking appear attractive. "We have to also look at intervening as early as possible so that when teenagers go to A&E as a result of drinking or in trouble with the police or at school, they are provided with the right advice and support to reduce their risky drinking and make healthier choices." A Department of Health spokeswoman said "We are already taking action to tackle problem drinking, including plans to stop supermarkets selling below cost alcohol and working to introduce a tougher licensing regime. "Our recent white paper set out our plan to ring-fence public health spending and give power to local communities to improve the health of local people and this includes improving alcohol treatment services through a greater focus on outcomes and payment by results. "We will also be publishing a new alcohol strategy later this year to follow on from the public health white paper."